Alaska’s world-class fisheries draw hordes of anglers every year, but watching fish can be fun too. 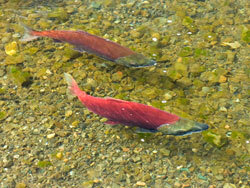 Time it right and you will see king, coho, sockeye, chum, or pink salmon battling en masse to make their way up Alaskan rivers and streams to spawn. Stroll along the Kenai Peninsula’s Russian River Falls in mid-summer and watch bright red sockeye salmon dodge anglers and bears as they power up the roiling waters-lunging and leaping as they go. Pull off the road at Juneau’s Sheep Creek in late summer and witness a run of chum salmon clogging the waters from shore to shore. To get in your good looks, take a tip from Alaska Department of Fish and Game sport fish biologists who have named the following locations some of the best places in the state to view fish. But first, help us protect this wonderful resource by considering these simple rules. Not only will you have a better experience, the fish will too! Avoid damage to the stream. Eggs and newly hatched fish are sensitive to silting or any physical disruption. You can reduce stream bank erosion by staying back from the stream edge. Use binoculars and polarizing glasses to see into the water without having to get too close. If stressed during spawning, fish may move to less suitable spawning sites, leading to reduced reproductive success. Consider crouching when you approach a stream to avoid being seen by watchful fish. Keep an eye on your shadow so it doesn’t cross the water. Move slowly and tread lightly to cut down on vibrations that carry into the water. Access — At Seward Highway near milepost 75, look for turnout by the bridge and walk along stream-side trails. Access — Look for viewing platforms and foot trails by the roadside. Access — At Seward Highway mile 117.4, take the Potter Marsh exit and follow road south to a parking lot by the boardwalk. Access — Accessible from Ship Creek Avenue between downtown Anchorage and the Air Force Base. The creek parallels the rail road tracks from the boat launch up through the air base. Handicapped access is available from the raised wooden platform behind the Comfort Inn on Ship Creek Avenue. Access — May be able to view fish from Elliot or Steese Highway bridges but runs are small and probability of seeing fish is low. Access — Follow the paths to footbridges by downtown Fairbanks and the Carlson Center. Access — View fish from the Clearwater State Recreation Site or float the river downstream to Clearwater Lake. Access — At milepost 34 on the Edgerton Highway, follow the paved road to a gravel and silt floodplain where there is a public campground and restrooms. Access — Turn off the Tok Cut-off to Mentasta Lake and follow a rough gravel road to the boat launch area and an old bridge over the creek. Comments — Comments – Permission from Mentasta Village is required to access the site. Call (907) 291-2319. Access — Turnoff at the Richardson Highway Bridge at milepost 129 on the Richardson Highway and follow a gravel road to an undeveloped public parking and camping area. Access — Just south of Tonsina along the Richardson Highway is gravel road access to the confluence of the Tonsina and Little Tonsina Rivers. Access — Look for a paved pullout with restrooms at Milepost 153 of the Glenn Highway. Access — At milepost 33 on the Edgerton Highway follow a paved and gravel road to a parking area with restrooms. Access — Heading south, the Anchor River follows the Sterling Highway for several miles beyond Anchor Point. Look for roadside foot trails along the stream. Access — At milepost 111 on the Sterling Highway at the intersection with Coho Loop Road, park at the Kenai Peninsula Wildlife Viewing Trail pullout to walk to creek viewing platform. Access — At milepost 38, the junction of Seward and Sterling Highways, follow signs to Tern Lake campground. Comments — At milepost 38, the junction of Seward and Sterling Highways, follow signs to Tern Lake campground. Access — Leave your car in the parking lot at Seward Highway milepost 23 and walk along the trail to the creek. You may hike up or downstream from there. Access — From highway pullouts between milepost 41 and 45 of the Sterling Highway, walk to Quartz Creek. Or take the turnoff to Quartz Creek campground at milepost 45 and walk to the creek from the campground. Access — At milepost 56 along the Seward Highway, follow the 19 mile road to Hope to access Lower Resurrection Creek. Access — Turnoff to the Russian River campground at Sterling Highway milepost 52.5. Park at the Russian River Falls trailhead a walk or bike about two miles to the falls viewing platform. Comments — Salmon are present at the falls all season. You may also hike up or down stream from the falls. Access — By vehicle either from the Nome River Bridge 3.5 miles from Nome on the Council Road or from the bridge located on Kougarok Road 3 miles northeast of Dexter. Access — View fish from the bridge located 7 miles west of Nome on the Teller Highway. Timing — July (pink and chum) and August (coho). Dolly Varden in spring after breakup. Access — View fish from the bridge located at Mile 50 on the Council Road. Access — Only by charter boat, private boat or floatplane to the Anan Creek trailhead at the mouth of Bradfield Canal, Southeast of Wrangell. Comments — A US Forest Service permit is required to enter the bear viewing facility, which will put you in close proximity to large numbers of migrating pink salmon as well as black and brown bears. Access — Drive south on Mitkof Highway to Man Made Hole recreation area at approximately milepost 20. Comments — Use boardwalk and trails to cross inlet and outlet stream. Access — The trailhead is located on the Hollis-Klawock Highway approximately 2 miles east of the Hydaburg Road junction at milepost 23.